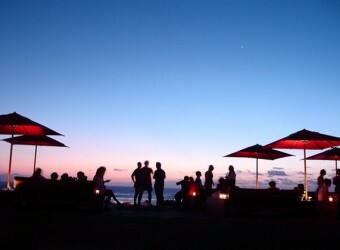 Bali Restaurant Ku De Ta is located directly on the beach, guests can watch beautiful sunset while enjoying delicious food, so come early to get good seats. Ku De Ta provides Mediterranean food with Asian taste such as Morocco taste, Japanese taste and other Asian country tastes using French cooking technique. The restaurant provides delicious food with fresh ingredients, menu changes depending on season and day. Ku De Ta is also famous as adult dining bar. It has a good sense of interior….and the sunset is very beautiful seen from here. I sat on a stylish chair and enjoyed a moment of bliss with her. The dishes were beautifully served and good taste. Ku De Ta’s breakfast time is from 08.00am to 12.00 noon. Enjoy a little luxury breakfast while overlooking Seminyak Beach.